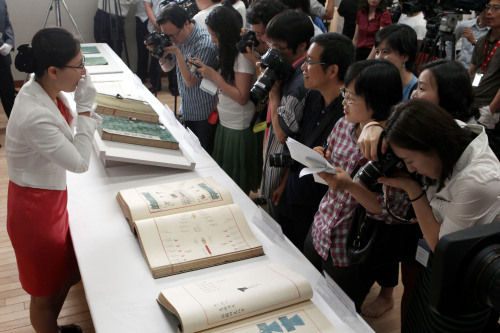 The National Museum of Korea on Monday revealed five significant copies of the total of 297 retrieved ancient royal books, known as “Uigwe,” to the media for the first time since their return from France earlier this year. Korea retrieved the royal documents ― which contain both text and hand-drawn illustrations of significant royal rites and ceremonies of the Joseon Dynasty (1392-1910) ― through a five-year renewable loan in four separate shipments from France since April 14. The final batch of 297 volumes arrived in Seoul from Paris on May 27. The five copies shown to the media were selected among the 297 volumes for their special historical significance and value. The books were: Uigwe for a Royal Feast (1630); Uigwe for the Ceremony of Offering Honorable Names to Queen Jangryeol (1686); Uigwe for the State Funeral of Queen Jangryeol (1688); Uigwe for the Funeral of Uiso, the Eldest Grandson of the King (1752); and Uigwe for the Construction of the West Palace (1831). French troops seized the royal books in 1866, along with a vast amount of silverware and other royal artifacts, during their invasion of Korea’s western island of Ganghwa. The invasion was in retaliation for the execution of French Catholic missionaries by the Joseon authorities. Before the invasion, the looted books had been stored at an ancient royal library “Oegyujanggak” ― an annex of the royal “Gyujanggak” library in Seoul ― on Ganghwa. Uigwe for a Royal Feast is the oldest copy among the remaining volumes of Uigwe that once belonged to Oegyujanggak. The book recorded the royal feast held by King Injo (1595-1649) of Joseon in March of 1630, wishing for longevity and good health for Queen Dowager Inmok (1584-1632). The copy is also one of the very few “copied” versions of Uigwe. Most of the returned books are reportedly original editions that were exclusively printed for the king. “Most of Uigwe books had one exclusive edition for the king and four to nine copied versions for scholars to read,” said Yoo Sae-rom, researcher of the National Museum of Korea on Monday. According to the museum, three of the five books shown on Monday do not have any copied versions remaining. A couple of silk covers of other volumes were also revealed to the media on Monday. The National Library of France in Paris removed the covers from 286 of the books and stored them separately for restoration purposes in the 1970s. The covers were shipped to Seoul along with all 297 volumes this year. “These silk covers display the beauty of original versions of Uigwe books that were exclusively printed for the king,” Yoo Sae-rom, researcher of the National Museum of Korea said. The museum’s special exhibition featuring the returned books, “The Return of the Oegyujanggak Uigwe from France: Records of the State Rites of the Joseon Dynasty,” will be open from July 19 to Sept 18.